Why is Dash a promising investment? Dash is a cryptocurrency that seeks to become an alternative to real-life cash. Developers designed the crypto as a fast and easy-to-use solution for everyday transactions. As a highly accessible coin, Dash has an almost unlimited ability to widen its user base. However, the whole crypto market is in a long-term downfall. What is the most probable future for the coin in 2019? What is our Dash price prediction? Let’s talk about it. Initially, Dash was just a security-focused Bitcoin fork. It became famous under the name of DarkCoin and was later rebranded several times. The development team had also changed the course of the coin’s construction. First Dash price predictions were based on the coin’s privacy features. Today, the currency is famous for its speed, privacy, and accessibility. Dash is old-school crypto that managed to remain relevant to this day. It is a proof of work cryptocurrency, powered by the X11 hashing algorithm. The algorithm is a combination of eleven cryptographic functions, used all at the same time. If one of the functions turns out to be vulnerable, other ten will continue to provide security for the network. The algorithm also helps the coin to offer nearly instant transactions and overall stability for the blockchain. The x11 mining within the Dash blockchain provides maintenance for the network. Still, it isn’t all there is to the Dash’s operating process. Miners are creating new blocks and validation transactions, but multiple important features come from the second tier of the network. The second tier consists of “masternodes”. Masternodes deposit a 1000 DASH as collateral and are interested in keeping the network stable. They also get 45% of block rewards, provided to miners. 10% of each reward comes to the network’s budget, and the other 45% remains in miners’ hands. Masternodes perform all the prominent Dash features like PrivateSend and InstantSend. 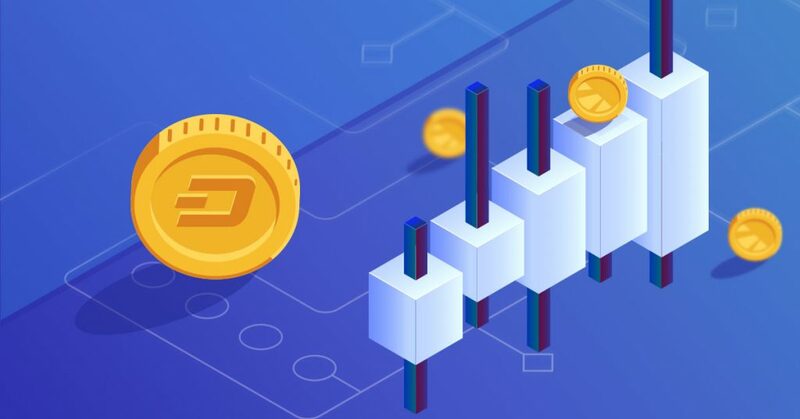 PrivateSend and InstantSend, alongside the decentralized governance of Dash, are the primary reasons for the positivity of the Dash coin price predictions. These are business-friendly features that are also useful for individuals. The DAO-based funding model of its development company, that Dash Core Group, Inc is also a big advantage. It ensures that the team is engaged in keeping the community happy and maintains the coin’s roadmap promises’ delivery. Dash experienced a significant decrease in price over the course of the previous year. This situation is almost universal in the current cryptocurrency industry. The latest market news wasn’t really bright for most coins. As we previously discussed in our Bitcoin Cash price prediction and our Zcash price prediction, pretty much every crypto is in a tough situation in terms of price movement. Even the DASH price chart for 2018 looks identical to the charts of the mentioned cryptos. For example, take a look at MIOTA price graph. So, the coin is currently acting similarly to most altcoins. The whole industry is copying the Bitcoin price graph, but only a few of them look like they can restore their position on the market. Anyway, let’s take a closer look at the Dash price graph. This year’s price peak of around $1285,5 USD per coin happened on January 7, 2018. It was the second biggest price indicator since the current record of 1550 USD per DASH reached on December 2017. Still, since then the coin was on a downfall. The currency went through a couple of price spikes, but the overall trend is sustainably descending. If we were to use the data of 2018 to build a linear Dash coin price prediction for 2019, the graph will tell us that the coin should already have a negative price. Still, it would be a terrible oversimplification. Let go through our fundamental analysis-based Dash price prediction. Even though technical Dash price analysis shows a high probability of its poor future performance, Dash is one of the coins that can be among the biggest gainers of 2019. The thing is, Dash managed to find its user base and knows how to work with it. For example, one of the latest news on Dash was its charity program success in Venezuela. What a great picture. These Venezuelan kids are buying breakfast with the donations they received from the world’s first directly distributed charity program, Dash Charity. Dash is a pretty big deal in Venezuela even outside of their charity activities. According to the DiscoverDash service, the coin is used for exchanges by over 47 business in the country’s capital, Caracas. For example, there are only around 30 in London. This clearly shows us the most significant advantage of Dash – people use it as an alternative to fiat money. Dash helps to hide from unwise decisions of the government, to transfer money across borders and for day-to-day transactions. Its accessibility is a huge advantage when talking about the price and overall future price predictions. The current state of the cryptocurrency market makes it especially hard to find solid grounds for making a Dash price forecast. Still, mentioned advantages of the coin and its stable position at the time of writing this article makes it a little easier to develop a prediction for the coin. Dash seems like it found a safe haven. The price had no significant leaps in either direction since December 2018. The large network of masternodes, C++ based core code and advanced technical expertise of the team should start to take over the trend. The most likely high mark of the financial year of the coin is around $500 USD per coin. The current price record can be reached in one year without the second wave of cryptocurrency hype. According to our most ambitious forecasts, the price might reach $1000 USD closer to the end of the year. Wide user base, clear reputation and a large number of use cases will move the price upwards. Dash price prediction for 2020 looks even more positive. The Dash Core Group, Inc. has taken a brilliant development direction. The team is establishing partnerships with payment systems, as well as with small and large businesses. An easy-to-use cryptocurrency is good, but it is awesome when it’s also easy to spend. When other cryptos are mostly concerned with the network bandwidth and blockchain-based features, Dash already established a fast reliable network and works with the user experience side of the product. The mentioned features can help the coin to gain even higher price of, most probably, around $1,500 USD per coin. Update: Binance Adds DASH/BNB and DASH/USDT Trading Pairs at 2019/03/28 4:00 AM (UTC). Prepare for a short-term price growth. You can exchange Dash coin at the best possible rate on Changelly.